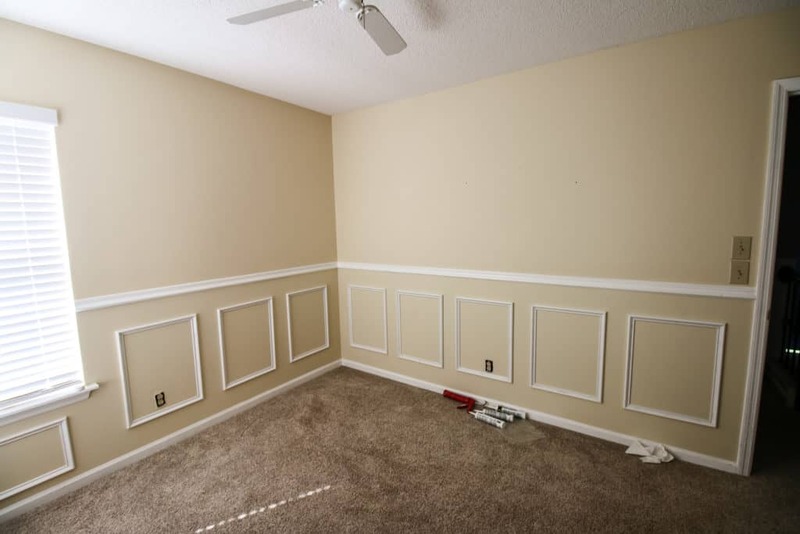 Looking for the easiest way to install DIY wainscoting? Adding wainscoting to a room is a quick, inexpensive and easy way to make any room in your house instantly look fancier, more formal or more complete. It is an easy DIY project that can be done in a weekend on a budget. Thank you to Woodgrain for sponsoring this post. All opinions are our own. We also used Woodgrain molding to create a DIY coffered ceiling and to hang crown molding in our bedroom! 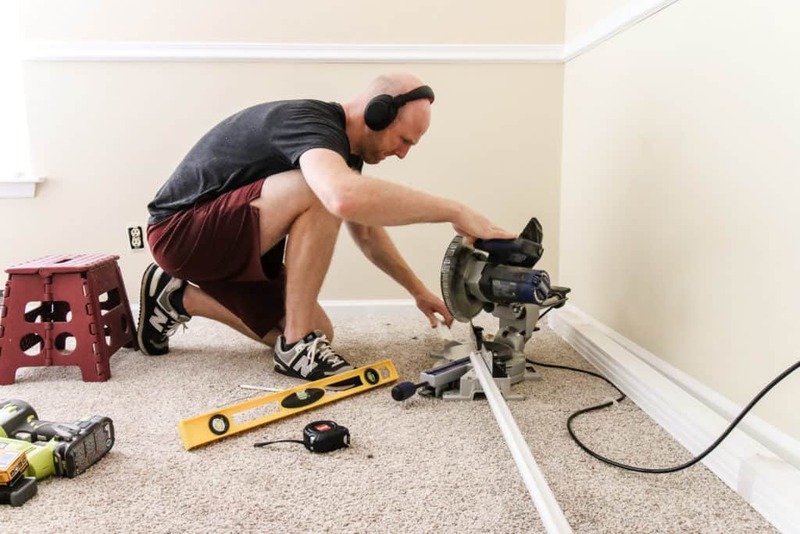 The easiest way to install DIY wainscoting is to gather your molding and paint up front after creating a quick design plan. For our project, we used Finished Elegance by Woodgrain, available at The Home Depot. Why? Finished Elegance is the premier interior moulding line that comes pre-painted and is easy to install. Their products are finished on all four sides, so, depending on your project, it is ready to go without you having to do any work to it at all. 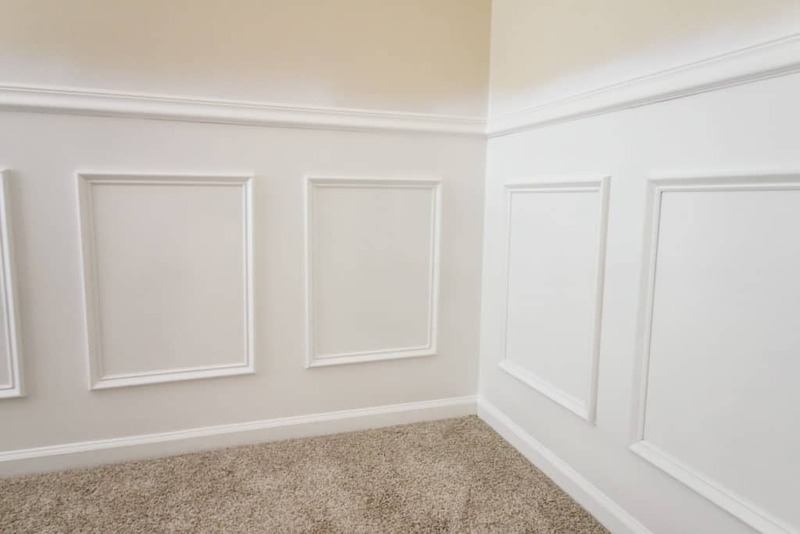 Finished Elegance has so many different shapes and sizes of moulding that we knew their products were the way to go for this project and will make your DIY wainscoting project so much easier. Start by deciding how high you want your chair railing to be if it isn’t already in place. Install that all the way around the room at the same height. We did ours at five inches from each. Then determine how wide they should be by measuring your wall and making sure you can evenly space out your squares. 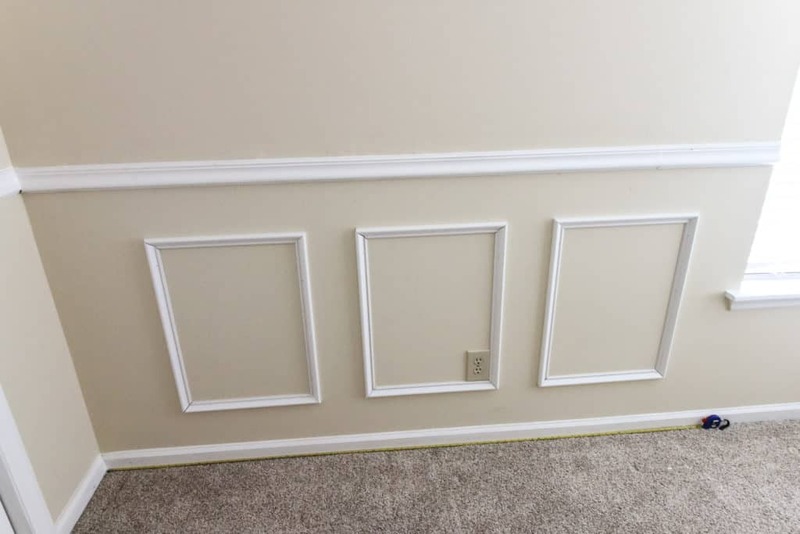 The best type of moulding to use for creating the squares in your wainscoting is to use base cap moulding. It is the right mix of elegant but not too detailed. Using Finished Elegance base cap moulding made the moulding ready to go. 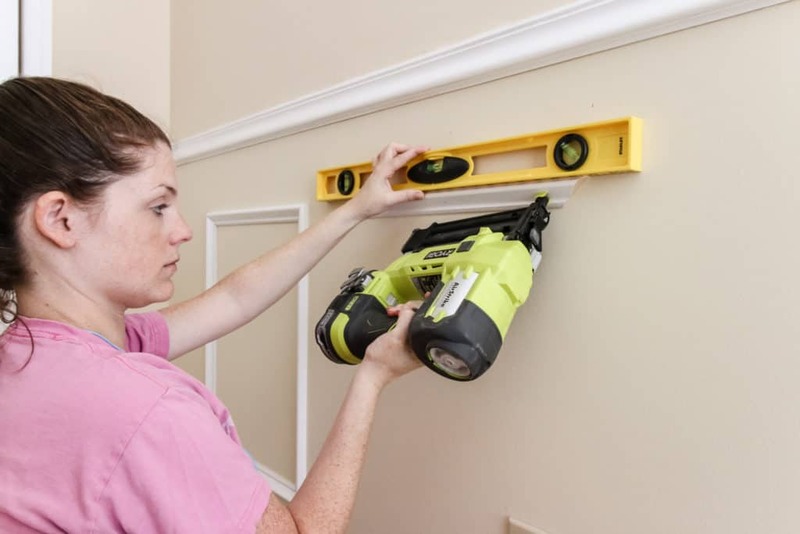 Cut your base cap moulding at 45 degree angles and line them up where you’ve determined on your wall. Use a nail gun to tack them onto the wall. Use caulk to cover up any gaps where the moulding comes together and to cover your nail holes. Finished Elegance even comes with caulk that is color-matched to their moulding. If your wall wasn’t already painted, use a paint sprayer (or traditional roller and brush) to paint your wall. We used our HomeRight paint sprayer to paint the wall and moulding all the same color. 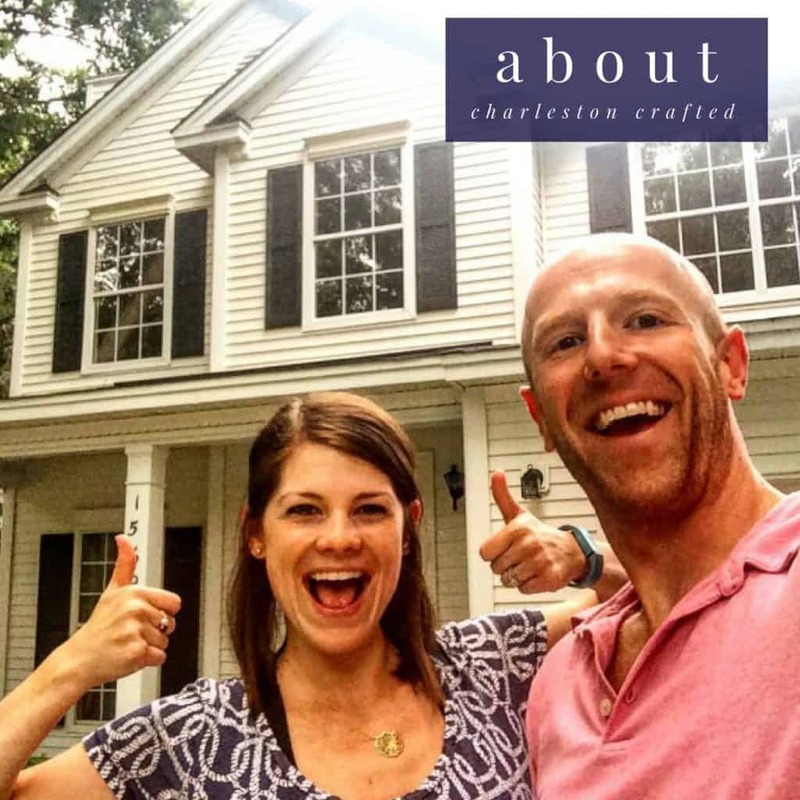 If you want to see how we did it in a video format, here’s the quick and easy video we made to show you. 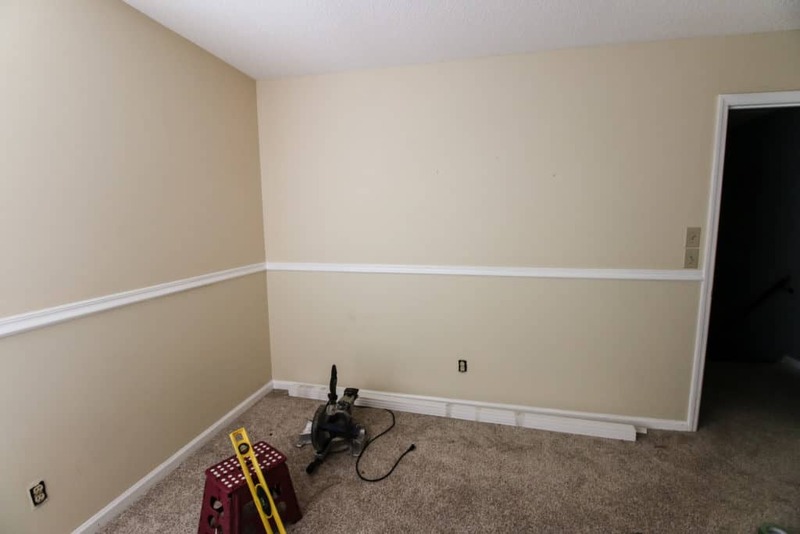 Installing DIY wainscoting in a room is one of the most simple ways to make a room look amazing and so much more finished than a standard fully-painted wall. Using Finished Elegance by Woodgrain can actually make that process even more simple, especially if your wall is already painted. There are lots of rooms that have chair railing already installed and have a white-painted lower wall. 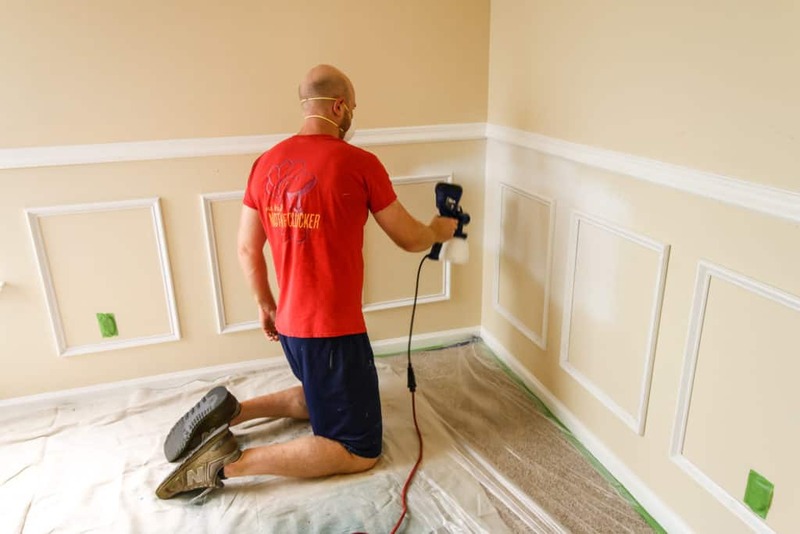 If you want to finish the job and make beautiful wainscoting, you can use Finished Elegance moulding products and their color matched caulk to finalize your look. Be sure to click over and check out our Jungle Theme Nursery Reveal! We love the look of our wainscoting in our new nursery! Now we just have to put wallpaper up above the chair railing to finish these walls off.